Yummus to hummus! I’m not sure if it’s the garlic, the smooth texture, the dipping factor or what exactly I love the best about it, but it is one of my favourite snacks and for good reason – it’s healthy and so simple to make in just a few minutes. Now, don’t get all worried about roasting the red peppers. Really folks, it’s not hard. Also, you need to please *please* promise me that you won’t go out and buy red peppers in a jar – they are not very good, they’re full of additives and sodium. The fresh ones will make all the difference in taste – I promise! They take about 45 minutes from start to finish, so if you’re in a hurry, do the peppers ahead of time so you can whip up the hummus later on. Put all of the ingredients into a food processor, and blend until smooth. Serve this colourful dip with veggies, pita wedges, breadsticks or crostini. 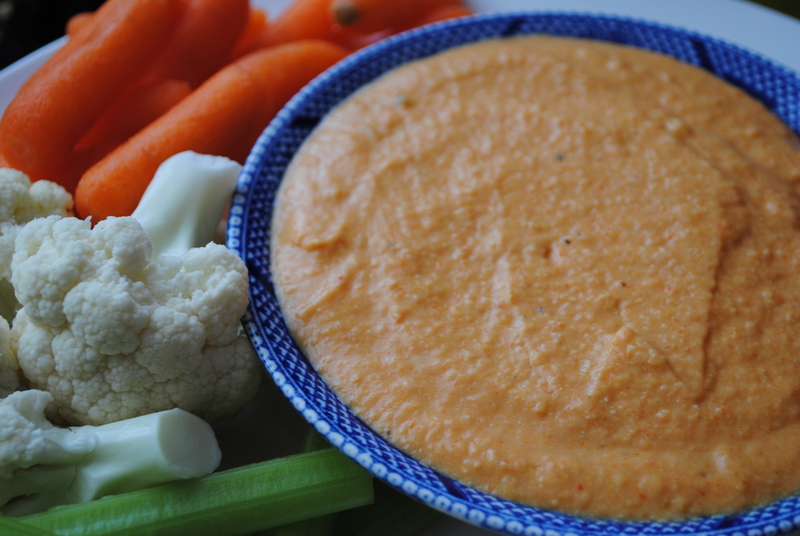 Absolutely love red pepper hummus but confess that have never made it. Going to pick up the ingredients and try it out. Yea Superbowl….fresh veg and hummus dip, here I come.